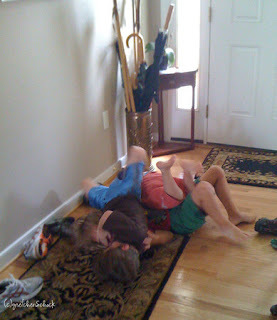 CocktailMom: College Park Patch: Boys Will Be Boys! Z in a hushed voice, "Punch me in the face. Come on I won't tell!" Fast forward to later in the evening. L has clearly kept to his promise, and Z comes to me pretending to cry. “L punched me in the face!” he said. I’m amazed he thinks this is actually going to work. “I heard you ask L to do it earlier,” I respond calmly. “But not that hard!” he said. Boys. I just don’t understand them. Gun fascination aside - I’ve accepted that I will never understand that aspect of them - why do boys insist on physical violence to entertain themselves? You get a group of boys together, and at some point there will be shooting and punches. Both of which start out as pretend. Then someone takes it too far, and we have a full-on fight. As a child, I remember the boys in my neighborhood doing the exact same thing. And now as a mom to two boys of my own, I’m experiencing it again, this time up close and personal. We don’t have a coffee table for fear of someone cracking their head open during a wrestling match, which has happened and resulted in a trip to the ER. The throw pillows that I took such care in choosing for the décor of the house are often weapons of choice. A family get-together with grown men who still put each other in headlocks and punch each other in the arm is proof that I need to be the one to readjust - clearly things won't be changing with age. It's obviously in their DNA. Best way I know to explain it is that there is a desire built into the male to be the protector of his family and this is sort of a training as you go to prepare for what may come later. Don't want to make it seem to noble but a guys got to have fun and sometimes that is the way too.